That’s right! Current products, all bought at my local 99¢ Only store – but each look like they’re from the past! It’s delightful! By God, I’m going to teach all of you to recognize anachronistic package design as well as appreciate it. Someday you’ll thank me for it. 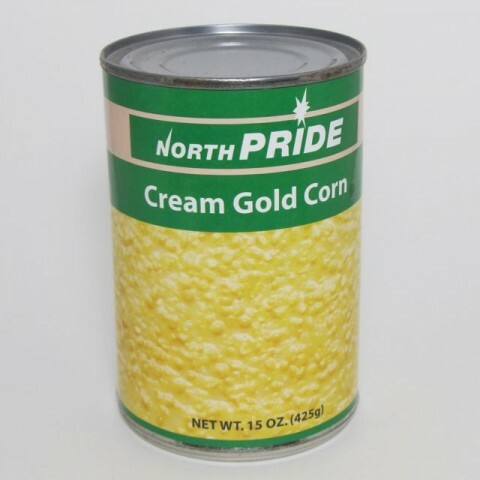 This North Pride Cream Corn looks like it’s from…the early 1970s. Proof of Its Modernity: Website address on back of label. Where You’d Expect to See It: In a dump basket of off-brand, five-for-a-dollar canned items in a Hispanic grocery store off the 5 freeway on the way to Palm Springs. Buy It Because: Makes a great side dish! • With a whopping 5-1/4” x 2-1/2” of its label devoted to a photo of its contents, you know North Pride is serious about creamed corn. I’d like to think that the photo is a cropped image of an enormous vat of creamed corn, snapped by a factory employee who has propped a ladder against it and leaned way over the edge; now you’d like to think this, too. The North Pride people made a wise decision in making much of the label (that which isn’t dedicated to the mural of creamed corn) a bright, healthy, vegetable-y green. But I’m curious, and delighted, as now are you, as to why they decided to go with a sort of pale flesh tone for the rest of it. Posted by Ted on June 16, 2011, 9:00 AM.